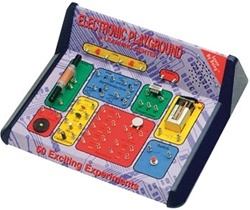 Easy to build circuits teach you the operation of over 50 electronic circuits. No tools or soldering required. Projects include finger touch lamp, magnetic bridge, voltmeter, morse code, alarm, electronic noisemaker, electronic keyboard, transistor radio, radio announcer, metal detector and more! Illustrated 76 page instruction guide.